Führer (German pronunciation: [ˈfyːʁɐ], spelled Fuehrer when the umlaut is not available) is a German word meaning leader or guide. As a political title it is most associated with Adolf Hitler. The word Führer in the sense of guide remains common in German, and it is used in numerous compound words. However, because of its strong association with Nazi Germany, the isolated word may come with some stigma and negative connotations when used with the meaning of leader, especially in political contexts. In the sense of "leader", the direct cognate of the English word, Leiter, is often used instead. 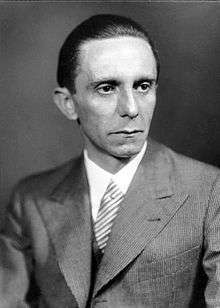 The word Führer has cognates in the Scandinavian languages, spelled fører or förare, which have the same meaning and use as the German word, but without political connotations. Führer was the unique name granted by Hitler to himself, in his function as Vorsitzender (chairman) of the Nazi Party. It was at the time common to refer to party leaders as Führer, with an addition to indicate the leader of which party was meant. 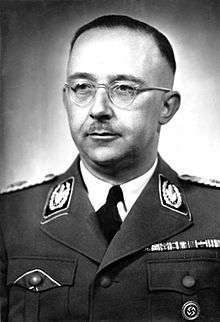 Hitler's adoption of the title was partly inspired by its earlier use by the Austrian Georg von Schönerer, a major exponent of pan-Germanism and German nationalism in Austria, whose followers also commonly referred to him as the Führer without qualification, and who also used the Heil Hitler salute, known as the "German greeting". Hitler's choice for this political epithet was unprecedented in Germany. Like much of the early symbolism of Nazi Germany, it was modeled after Benito Mussolini's Italian Fascism. Mussolini's chosen epithet il Duce or "Dux" in Latin ('the Leader') was widely used, though, unlike Hitler, he never made it his official title. The Italian word Duce (unlike the German word Führer) is no longer used as a generic term for a leader, but almost always refers to Mussolini himself. One day before the death of Reichspräsident Paul von Hindenburg, Hitler and his cabinet decreed a law that merged the office of the president with that of Chancellor. Hitler therefore assumed the President's powers without assuming the office itself – ostensibly out of respect for Hindenburg's achievements as a heroic figure in World War I. Though this law was in breach of the Enabling Act, which specifically precluded any laws concerning the Presidential office, it was approved by a referendum on 19 August. Hitler used the title Führer und Reichskanzler ("Leader and Chancellor"), highlighting the positions he already held in party and government, though in popular reception, the element Führer was increasingly understood not just in reference to the Nazi party but also in reference to the German people and the German state. Soldiers had to swear allegiance to Hitler as "Führer des deutschen Reiches und Volkes" (Leader of the German Realm and People). 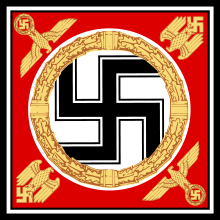 The title was changed on July 28, 1942 to "Führer des Großdeutschen Reiches" ("Leader of the Greater German Realm"). In his political testament, Hitler also referred to himself as Führer der Nation (Leader of the Nation). One of the Nazis' most-repeated political slogans was Ein Volk, ein Reich, ein Führer – "One People, One Nation, One Leader". Bendersky says the slogan "left an indelible mark on the minds of most Germans who lived through the Nazi years. It appeared on countless posters and in publications; it was heard constantly in radio broadcasts and speeches." The slogan emphasized the absolute control of the party over practically every sector of German society and culture – with the churches the most notable exception. Hitler's word was absolute, but he had a narrow range of interest – mostly involving diplomacy and the military – and so his subordinates interpreted his will to fit their own interests. According to the Constitution of Weimar, the President was Supreme Commander of the Armed Forces. Unlike “President”, Hitler did take this title (Oberbefehlshaber) for himself. When conscription was reintroduced in 1935, Hitler created the title of Commander-in-Chief of the Armed Forces, a post held by the Minister for War. He retained the title of Supreme Commander for himself. Field Marshal Werner von Blomberg, then the Minister of War and one of those who created the Hitler oath, or the personal oath of loyalty of the military to Hitler, became the Commander-in-Chief of the Armed Forces while Hitler remained Supreme Commander. Following the Blomberg–Fritsch Affair in 1938, Hitler assumed the commander-in-chief's post as well and took personal command of the armed forces. However, he continued using the older formally higher title of Supreme Commander, which was thus filled with a somewhat new meaning. Combining it with "Führer", he used the style Führer und Oberster Befehlshaber der Wehrmacht ("Leader and Supreme Commander of the Wehrmacht"), yet a simple "Führer" since May 1942. An additional title was adopted by Hitler on 23 June 1941, declaring himself the "Germanic Führer" (germanischer Führer) in addition to his duties as Führer of the German state and people. This was done to emphasize Hitler's professed leadership of what the Nazis described as the "Nordic-Germanic master race", which peoples such as the Norwegians, Danes, Swedes, and Dutch, etc. were considered members of in addition to the Germans, and the intent to annex these countries to the German Reich. Waffen-SS formations from these countries had to declare obedience to Hitler by addressing him in this fashion. 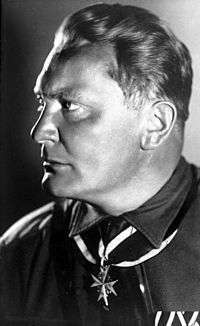 On 12 December 1941 the Dutch fascist Anton Mussert also addressed him as such when he proclaimed his allegiance to Hitler during a visit to the Reich Chancellery in Berlin. He had wanted to address Hitler as Führer aller Germanen ("Führer of all Germanics"), but Hitler personally decreed the former style. Historian Loe de Jong speculates on the difference between the two: Führer aller Germanen implied a position separate from Hitler's role as Führer und Reichskanzler des Grossdeutschen Reiches ("Führer and Reich Chancellor of the Greater German Empire"), while germanischer Führer served more as an attribute of that main function. As late as 1944, however, occasional propaganda publications continued to refer to him by this unofficial title as well. National Socialist propaganda occasionally used a number of honorary titles when referencing Hitler. 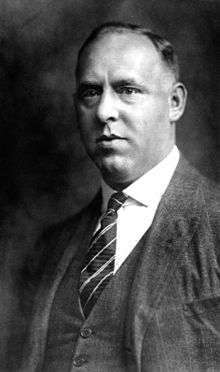 Supreme Judge of the German People (German: Oberster Richter des Deutschen Volkes) – Announced by Hitler on 30 June 1934 after the "Night of the Long Knives"
Greatest Military Commander of All Time (German: Größter Feldherr aller Zeiten) – A title bestowed on Hitler by General Field Marshal Wilhelm Keitel after the successful western campaign against France and the Low Countries in the summer of 1940. Shortened derisively to "Gröfaz." 1 2 Thamer, Hans-Ulrich (2003). 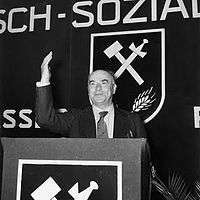 "Beginn der nationalsozialistischen Herrschaft (Teil 2)". Nationalsozialismus I (in German). Bonn: Federal Agency for Civic Education. Archived from the original on February 8, 2008. Retrieved 4 October 2011. 1 2 Winkler, Heinrich August. "The German Catastrophe 1933-1945". Germany: The Long Road West vol. 2: 1933-1990. pp. 38–39. ISBN 978-0-19-926598-5. Retrieved 28 October 2011. ↑ Mitchell, Arthur H. (2007). Hitler's Mountain: The Führer, Obersalzberg, and the American Occupation of Berchtesgaden. Macfarland & Company Inc., Publishers, p. 15. ↑ Joseph W. Bendersky (2007). A Concise History of Nazi Germany: 1919-1945. Rowman & Littlefield. pp. 105–6. ↑ De Jong, Louis (1974) (in Dutch). Het Koninkrijk der Nederlanden in de tweede wereldoorlog: Maart '41 - Juli '42, p. 181. M. Nijhoff. ↑ Bramstedt, E. K. (2003). Dictatorship and Political Police: the Technique of Control by Fear, pp. 92-93. Routledge. 1 2 3 De Jong 1974, pp. 199-200. ↑ Adolf Hitler: Führer aller Germanen. Storm, 1944. ↑ Toland, John (1977). Adolf Hitler, pp. 569-570. Book Club Associates, Doubleday & Company, Inc.
↑ Neumann, Bernhard Josef (2010) Däh, jetz ham mer den Kriech (da, jetzt haben wer den Krieg - 1939-1945), p. 401. Books on Demand GmbH, Norderstedt. ↑ Erdmann, Karl Dietrich (1978). Handbuch der deutschen Geschichte: Deutschland unter der Herrschaft des Nationalsozialismus, p. 541. Klett. ↑ The Hitler Icon: How Mount Athos Honored the Führer. Retrieved 22 May 2013.